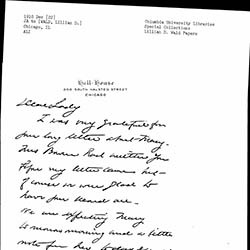 Addams tells Wald that she is rearranging her schedule to attend her nephew's wedding and invites Wald to come to Chicago with her. 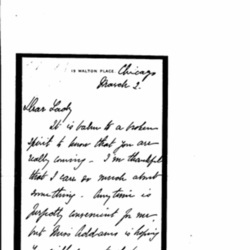 Addams makes plans for Wald to accompany her to Chicago from New York after Addams' trip to the East Coast in March. 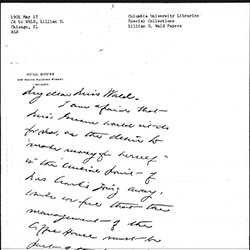 Smith writes about Wald's planned trip, sickness and death in her family, and the installation of an organ in her mother's memory at Hull-House. 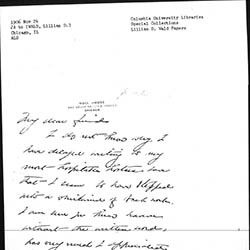 Family, Health, Hull-House Visits, NotAddams! Addams thanks Wald for her contributions to the Truancy Conference and encloses a check to cover expenses. 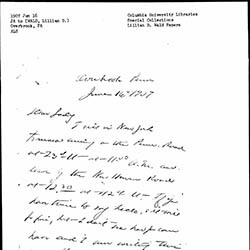 She remarks on Washington and Cincinnati trips. 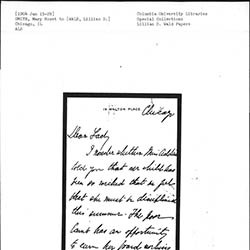 Addams discusses a blanket she sent to Wald, and chides Wald for returning the check she sent her for a recent speech. Addams checks in with Wald. 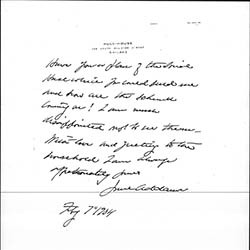 Addams remarks on her neglect in thanking her Washington hostess, sends Ellen Gates Starr's book and comments on the engagement of Rose Pastor and J. G. Phelps Stokes. 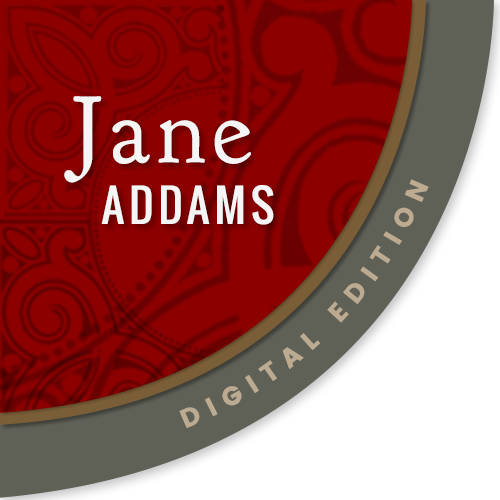 Addams thanks Wald for her hospitality in New York and mentions the death of Sarah Smith. 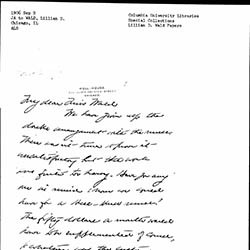 Addams writes Wald about hiring a Miss Green for the Coffee House if Ida Cronk leaves. 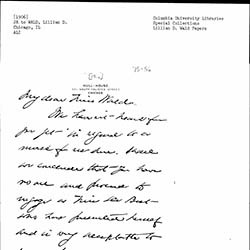 Addams encourages Wald and McDowell to attend the Peace Congress in Boston so that they can meet to discussion Women's Trade Union League matters. 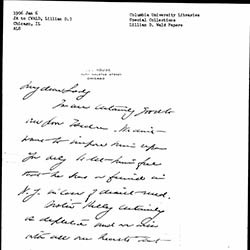 Addams discusses Emma Goldman's case with Wald. Smith chats with Wald about plans for the summer and her ward. 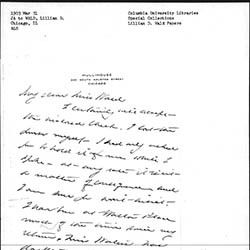 Addams asks Wald to send letters and proofs to Miss Haskell. 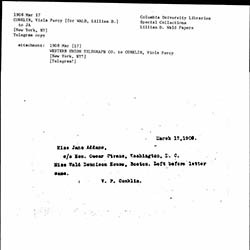 Addams redirected a proof to Boston and apologizes for failing to tell Wald; she also reports on her enjoyment of the east coast. 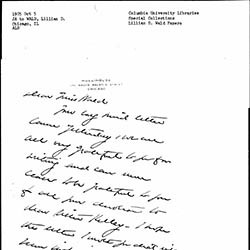 Addams thanks Wald for her letter updating her on Florence Kelley's condition. 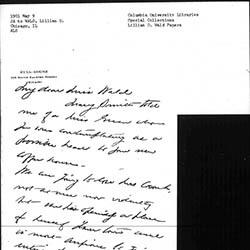 Addams asks Wald for a recommendation of a nurse to hire at Hull-House. 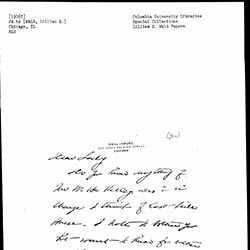 Addams asks Wald if she knows Mr. W. H. Kelley. 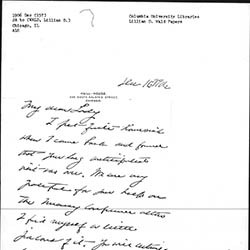 Addams discusses Wald's kindness to Isidore Friedman and Florence Kelley's condition. 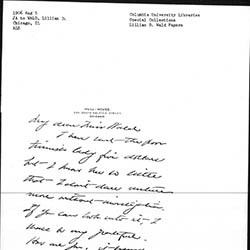 Addams writes to Wald about an article that she wrote. 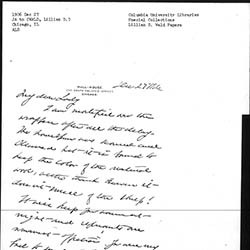 Addams reimburses Wald for cab expenses during her trip to New York. 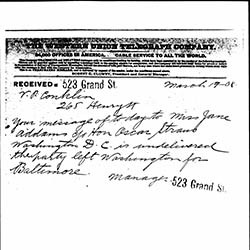 Conklin telegrams Addams to let her know that Wald was in Boston, and did not get Addams' letter. 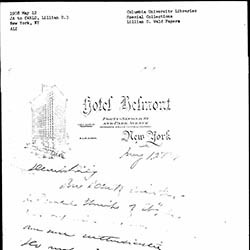 The manager of the New York telegraph office tells Conklin that her telegram to Addams was not delivered as Addams had left the city. 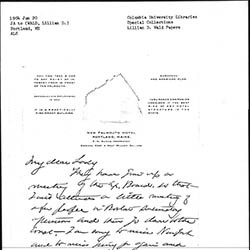 Addams writes Wald in hopes of seeing her when she passes through New York. 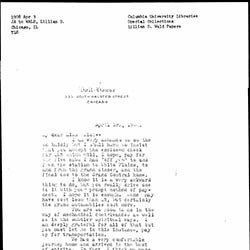 Addams writes Wald about the importance of the Ostrow case to the Jewish immigrant community and makes plans to meet with Cyrus Adler and Oscar Straus in Washington. 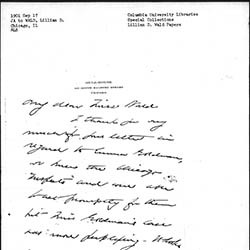 Addams thanks Wald for her assistance with Mary Smith and promises to write a longer letter after Christmas. 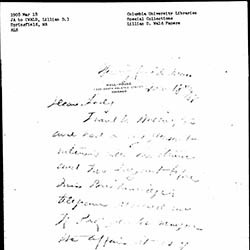 Addams accepts Wald's request to visit with some settlement people and sends news about Mary Smith's health. 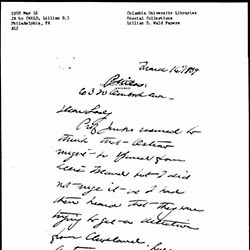 Papers concerning both the administration of the Henry Street Settlement and Wald's involvement in numerous philanthropic and liberal causes. 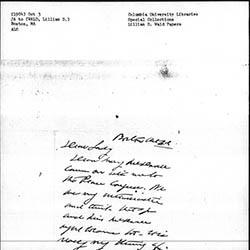 Her office files trace the foundation and growth of the Henry Street Settlement from 1895 until 1933. 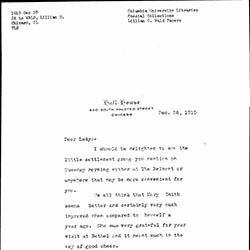 Her other activities include child welfare, civil liberties, immigration, public health, unemployment, and the peace movement during World War I. 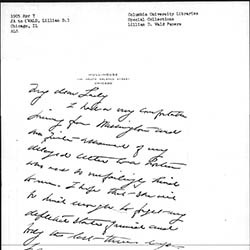 The correspondence files contain letters from public figures and writers including Jane Addams, Roger N. Baldwin, Van Wyck Brooks, Lavinia L. Dock, John Galsworthy, Samuel Gompers, William D. Howells, Charles Evans Hughes, Mabel Hyde Kittredge, Frances Perkins, Dorothy Thompson, Norman Thomas, Ida Tarbell, Margaret Sanger, and Jacob A. Riis.